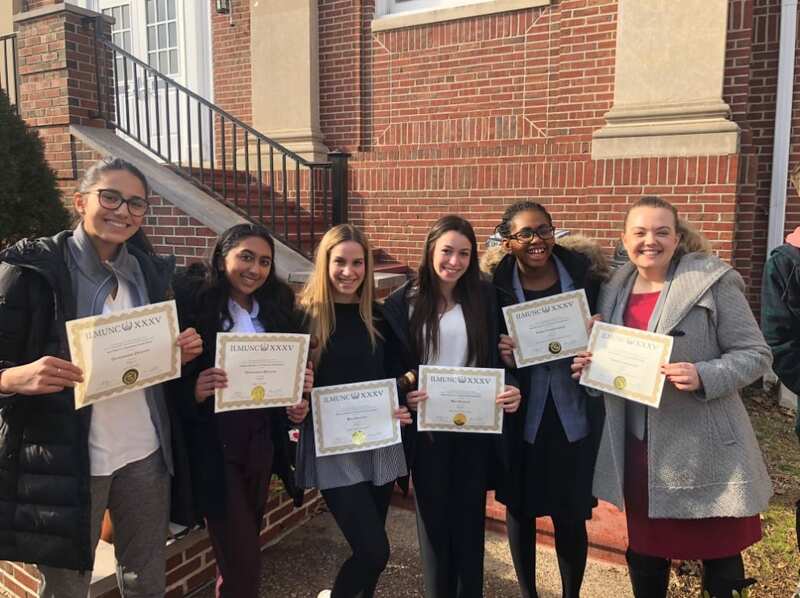 Thirty-one Upper School students traveled to Philadelphia from January 31 – February 3 for the Ivy League Model United Nations Conference, hosted by the University of Pennsylvania. Commented advisor and History Department Chair Clark Thomson: “After four glorious, and somewhat chilly, days in the metropolis across the Delaware, the Moorestown Friends School Model UN delegation returned to school Sunday with many stories, successes, and some strong recognition.” Topics of discussion included water security, border disputes, and safe non-military transport of solar energy to earth from space, among many others. Miles Oglesby ’20 earned verbal commendation for his work on UN Office of Outer Space Affairs. Shelby Deibler ’20 and Sammy Bastien ’20 earned verbal commendation for their work on the Commission on the Status of Women. Aani Desai ’22 and Christine Chandran ’21 earned Outstanding Delegation for their work on the Legal Committee. Jordan Brunner ’19 and Mariana Goldlust ’19 earned Best Delegation for their work on the World Health Organization. Pictured (L to R): Aani Desai, Christine Chandran, Mariana Goldlust, Jordan Brunner, Sammy Bastien, Shelby Deibler. Not pictured: Miles Oglesby. Photo credit to MFS WordsWorth.